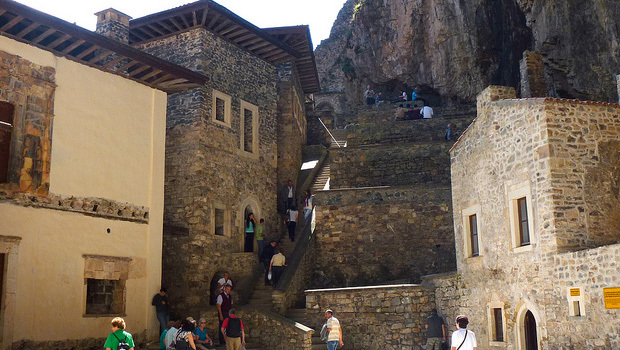 Sumela Monastery is a Greek Orthodox monastery, standing at the foot of a steep cliff. At an altitude of about 1,200 metres, it is a major tourist attraction. Safety is our number one focus, hence our ground handling staff are our very own company, Authentic Holidays. Students are not passed to 3rd party companies, Authentic Holidays staff are with the students for the entire trip. We are the only Australian Tour Operator with our own Turkish company. For more than 13 years, Fairy Chimneys Travel has been creating unforgettable Turkey travel experiences. Every member of the team has lived in or visited this intriguing destination. Many school groups have previously enjoyed traveling with us, and on behalf of many specialist travel agents and operators. We provide a full service with air+land+insurance packages which are very affordable for students and their parents. Fairy Chimneys Travel also incorporates admission fees for carefully selected highlights. So you don’t encounter unexpected expense or miss opportunities during your tour. We know that everyone has different ideas about what makes a great educational trip. That’s why Fairy Chimneys Travel offers our skill and knowledge to help develop the perfect custom trip for your school. Wherever possible, your special needs will be accommodated and we offer full agency service to the extent that you need it. Fairy Chimneys Travel wants your tour to blend close cultural encounters, delectable new flavours and amazing fun activities. That’s why Fairy Chimneys Travel offers such wide-ranging options. Amongst our school trips you’ll find varied service levels, popular and out-of-the-way destinations and much more. If you're interested in Gallipoli we offer school trips that take in a dawn service on ANZAC Day*, or you can experience the serenity away from the ANZAC Day crowd. *2015 Dawn service attendance is subject to ANZAC Ballot Entry.